The reading describes a time when the Jewish civilization was at its most advanced and powerful. Solomon is now king. He is going to use this time of peace, prosperity, and abundance to fulfill a promise that his father had made. He would build a great temple for God. The temple will stand for more than four hundred years, but not even Solomon’s temple can last forever. 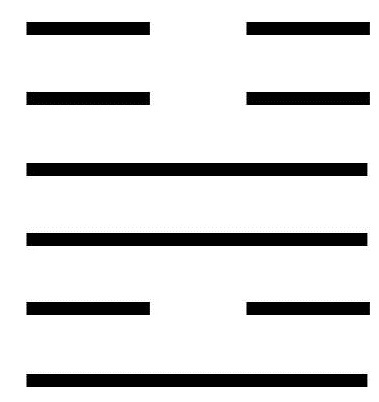 This hexagram consists of the lower trigram Christ and the upper trigram Word. The Word and Christ are two aspects of the same manifestation. The Word is the creative outpouring of God power. Christ is God power made manifest as human. Christ is the God child who shows us the way to also become God children. We are then no longer aligned with the finite and limited but with the infinite and unlimited, and we have within our grasp the inexhaustible abundance the Word promises. To appreciate the great abundance that God has provided, knowing that all worldly wealth is fleeting. To recognize that not all are equally able to bring about a time of abundance; it takes a great leader. To understand that not all are equally able to lead in a time of abundance; it takes wisdom to understand how to make use of the abundance God has given. To carefully investigate the facts, enforce the laws, and apply discipline swiftly and fairly. A moving line in the bottom position gives advice on how to bring about desired abundance. It takes the union of clarity and energy. These two attributes may be found in two people who form a close partnership and commit to that partnership for the long term. A moving line in the second position suggests that politics and conspiracies have come between a leader who has a plan to bring about abundance and a helper who is critical to that plan. The line warns against moving forward at this time. Doing so will only result in obstructions. Instead, the line suggests remaining outwardly still while inwardly gathering wisdom. In time, truth will win out. A moving line in the third position warns that the inauspicious conditions warned about in the previous (second) moving line have become even more pronounced. The intrigue is now so intense that the leader has little allure. Now, even the pettiest and most insignificant riffraff are able to distract from what needs to be accomplished. There is nothing the leader can do at this time. A moving line in the fourth position suggests that the darkness that has been described in the last two moving lines is beginning to ebb. It is now time to bring Wisdom and Action together into one joyful whole. A moving line in the fifth position advises the ruler to be open to the wisdom of others. Fortunately, there are many wise and able people who can offer wise counsel. This brings success to all. A moving line in the top position describes one who is arrogant and seeks abundance only for Ego satisfaction. This person’s thirst for power quickly alienates everybody and leaves the arrogant one isolated.